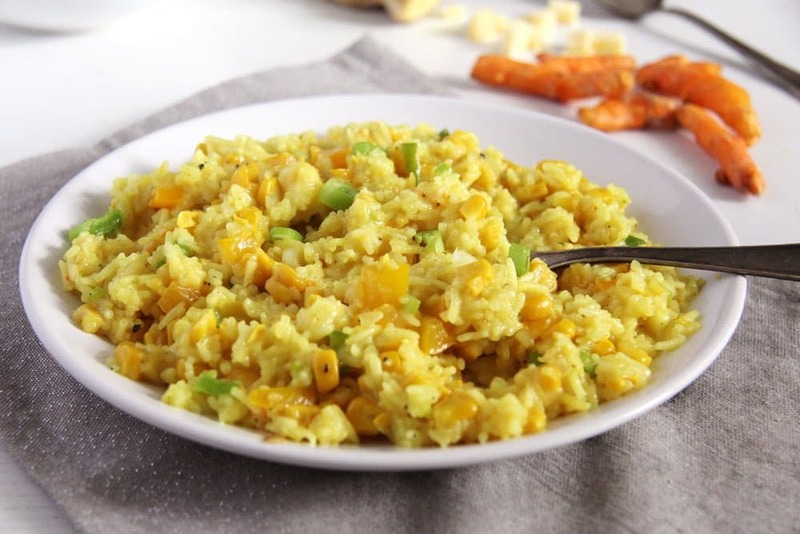 Golden turmeric rice with corn, peppers and cheese, a super quick and delicious dish for the entire family. But on that day, I had nothing planned, no leftovers from the previous day, not even enough bread to make a few sandwiches. What I had was some corn, one bell pepper and rice and potatoes. So I went for rice, as it doesn’t need any peeling and in the case of the basmati, it also doesn’t need a long cooking time. I quickly chopped all I found in the fridge, threw some rice and some stock in the pot and finished off with a piece of Gouda. The meal was ready before the kids had the time to change their clothes and wash their hands and it was so good, that I immediately wrote down the ingredients, just to make sure that I won’t forget about it. Peel and grate the turmeric and the ginger. Chop the bell pepper into small cubes. Cut the corn kernels off the cob. You should have roughly 150 g/ 5.3 oz kernels, a bit more or less is not really important. Heat the coconut oil in a non-stick pan and cook the onion and garlic until translucent. 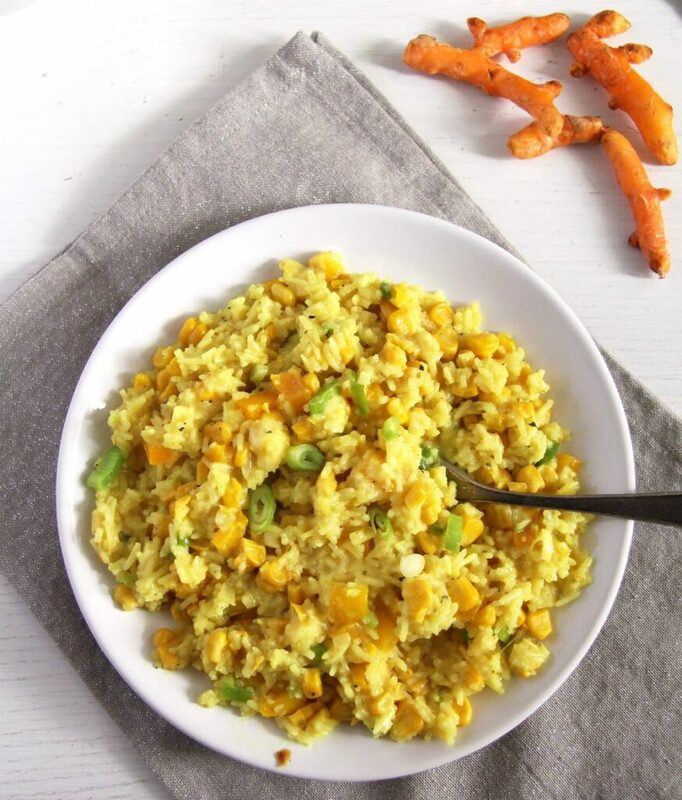 Add the turmeric, ginger, bell pepper and corn kernels and cook for about 5 minutes stirring from time to time. Add the washed and drained basmati rice and stir to mix with the veggies and coat with oil for 1 or 2 minutes. Add the stock, some salt and some stock powder, if you find it necessary. I usually add some stock powder when I use vegetable stock, but never in case of homemade chicken stock, that has enough flavor on its own. Taste the cooking liquid, it should be slightly salty. Bring to a boil, cover, turn the heat to low and simmer for about 10 minutes. Check and add more broth if necessary, the rice should not be too dry. I added about 150 ml/ ½ cup more. Add the finely sliced scallions, stir, cover and continue cooking for about another 5-6 minutes or until the rice is tender. In the meantime cube the cheese finely. Turn off the heat, add the cheese to the pot, stir well, add more salt if necessary and lots of freshly ground black pepper, cover and let stand for a few minutes until the cheese is melted. 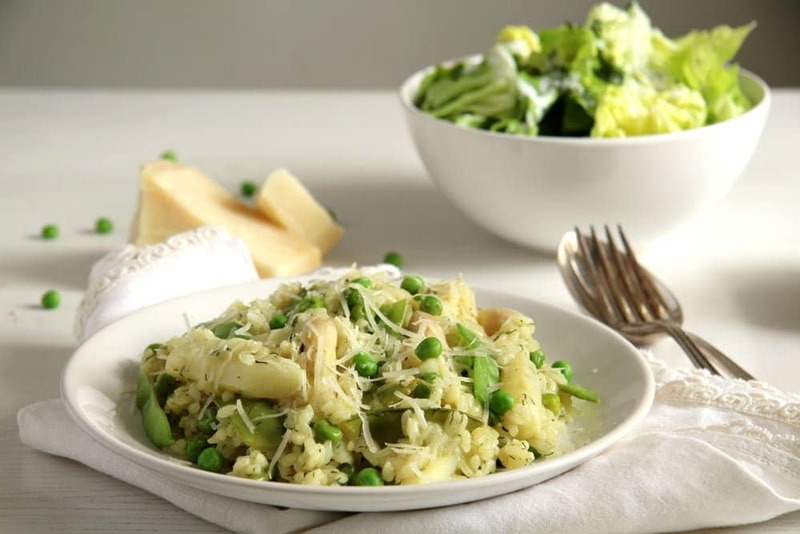 Serve immediately with green salad. Looks very yummy! 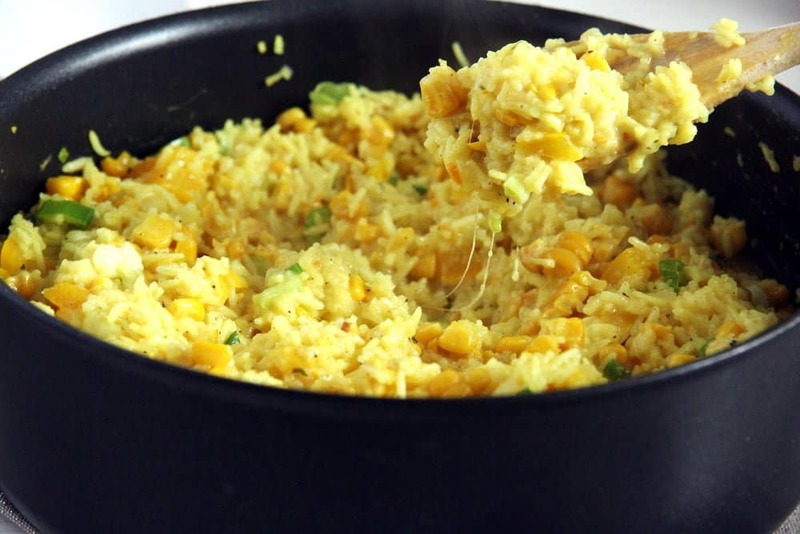 We love turmeric rice in this house and love to add peanuts for crunch. 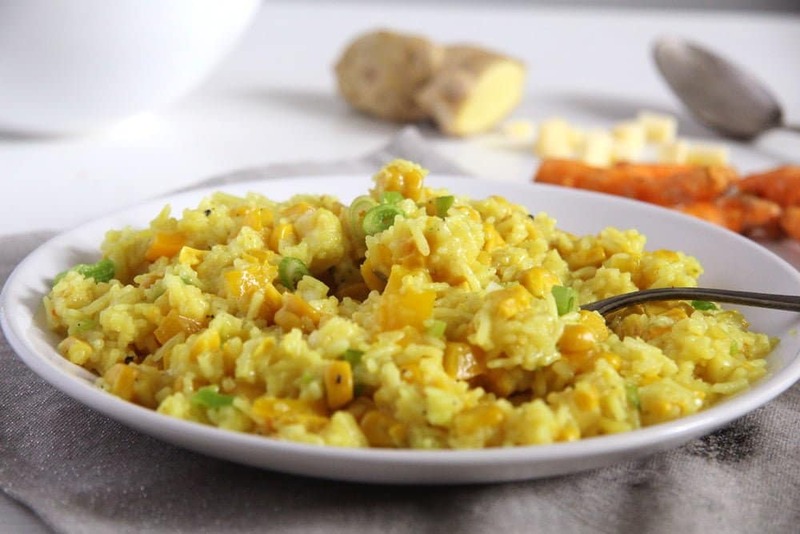 Turmeric rice is a staple food in my family. And this one with the cheese sounds even more inviting, Adina. I would make it using gouda. Thanks for inspo. 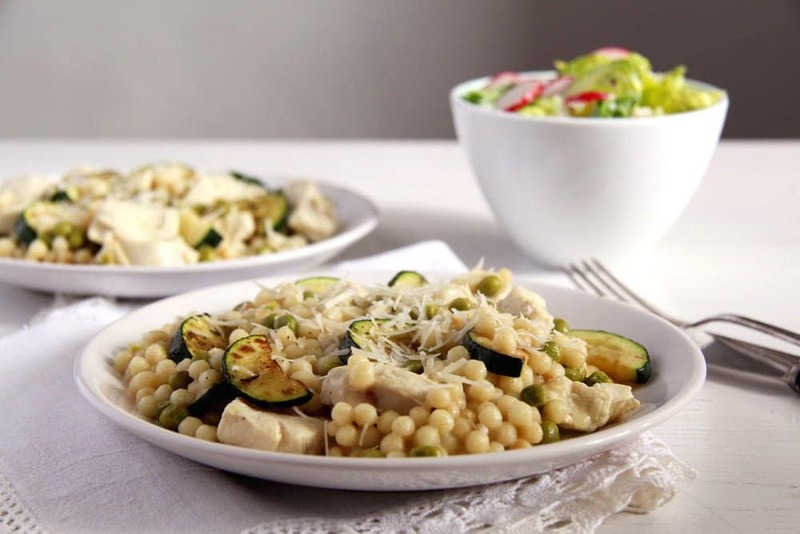 You certainly made a great dish, even if you were pressed for ingredients and time! I love the addition of cheese in there. Such a different idea! I can understand why you’ve made multiple times! Looks so good, Adina 🙂 Total comfort food! Sometimes great dishes come out of nothing. This rice looks and sounds divine. Love it! Oh, my! The type of dish to eat and repeat. It sounds great and it looks great too, the colour is so vibrant. We buy a fresh jar of turmeric every few months for just one recipe. I’m so excited by all of these different recipes that I can use the extra in. Hands down this rice is my favorite especially with that creamy cheese! If dinner wasn’t already sorted I would be making a batch tonight 🙂 If I wanted to include a few handfuls of fresh spinach do you think it would taste best added near the end or sauteed with the onion? I would say near the end would be better, especially if you have that tender baby spinach. Let me know how that works, Brie.